Analog Recording Console Forum • View topic - Can anyone help me to identify this switch? Can anyone help me to identify this switch? This is my first post here, I am trying to find out the make of this switch - it came out of a defunct Leevers-Rich tape deck I once owned ... does anybody maybe recognize it? It is a modular push-button leaf switch with a hollow actuator barrel that you can put a T2 telephone slide bulb inside, and a push on cap (square, or sometimes round) that can be fitted with different coloured lenses. The leaf contacts can be stacked to make 4 (maybe even 6) pole versions. I've seen these in old broadcast desks as well, but feel certain someone else must have come across them too. I am really hoping that one of the old hands can identify it so that I can find out whether replacement leaf contacts might be available. Please move this topic if it is in the wrong place. 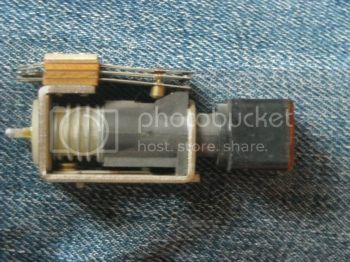 Re: Can anyone help me to identify this switch? I've been told on another forum that they are made by (Pye)TMC in England. Totally figures, due to the period, and the similarity with the Pye lever switches that Neve used to use. Thanks to radardoug in NZ.